The old real estate maxim highlights the importance of location, location, location for choosing a home, and it holds true for other endeavors- including Chinese tea production. 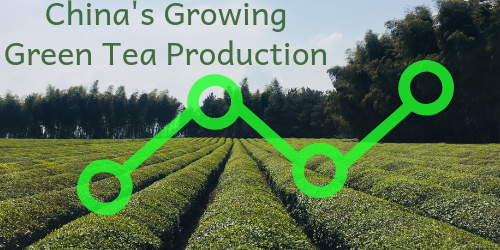 Production areas of Chinese tea get generally divided in two ways: by the province or by regions. Regions may include multiple provinces or parts of provinces, and can be helpful in understanding similarities in climatic and geographic conditions, and/or styles of tea produced. Within the China tea industry, most people will simply refer to provinces. The last decade has seen remarkable changes in the volumes of tea produced and the amount of tea bushes planted in China. 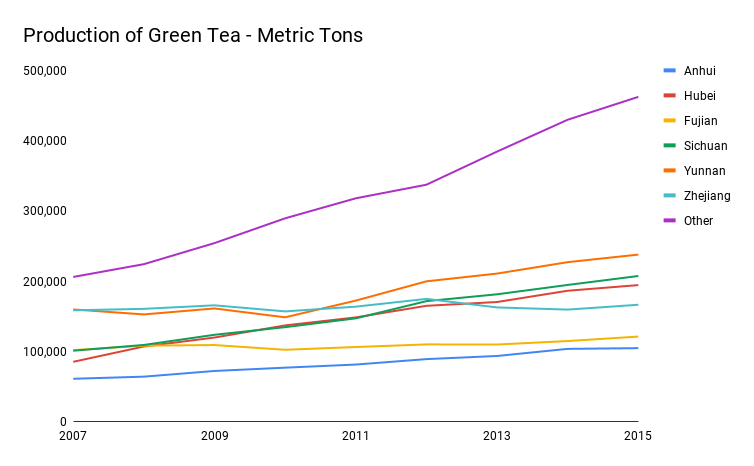 In general, China is shifting towards producing more green teas. The Economist reports that 68% of current Chinese tea production is loose leaf green tea. 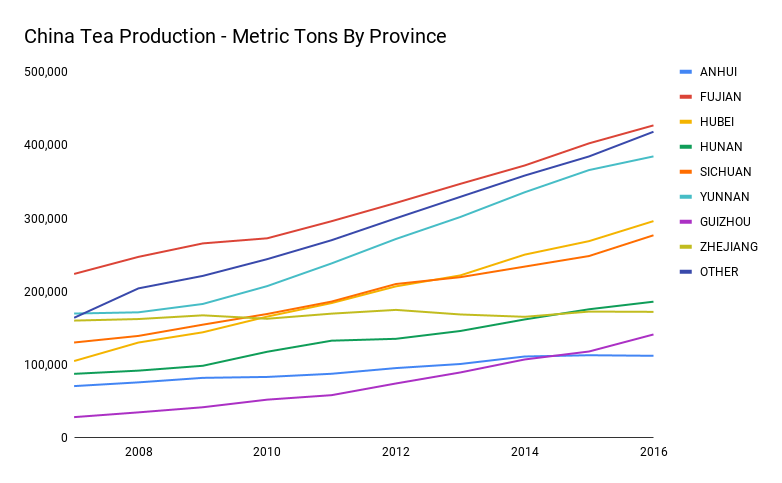 Guizhou and Hubei provinces saw some of the biggest gains in overall production between 2007 and 2016, with Guizhou hitting a nearly 400% increase, and Hubei 182%. During that time, Hubei doubled their number of hectares of tea, and Guizhou tea hectares increased nearly five fold. But production and acreage gains aren’t only about having the most green tea. The Southwestern provinces of Sichuan and Yunnan produced a combined 445,000 metric tons of green tea in 2015 compared to 166,000 metric tons of green produced in Zhejiang province. 1. The better known, recognized styles of tea come from these provinces. These include dragon well, and gunpowder from Zhejiang Province. The region also produces competitively priced sencha and matcha. These provinces’ long-established capabilities give them further operational efficiencies. 2. Zhejiang’s position as a coastal province gives it competitive advantage for more timely and efficient international transport, and more immediate access to the majority of China’s domestic consumers. 3. Sichuan and Yunnan are more diversified in teas produced. Approximately 96% of the tea produced in Zhejiang is green tea, while only 65% of Yunnan province’s tea is green tea. Sichuan and Yunnan have to spread their processing abilities across more non-green teas: particularly, black and dark tea.